This top half of this page outlines Vaccination requirements followed by the risks associated with dogs attending daycare and boarding. PLEASE READ CAREFULLY TO BE SURE YOU ARE FULLY INFORMED. Adult Dog: Standard Foundation Vaccines and we request with revaccinations at 5 years OR our preference of a Titer test to prove antibodies are present. If you wish not to inoculate your fur baby for Lepto, we do ask for a letter . IMPORTANT: There must be a 72 hour separation between the administration of a vaccine and any dog attending daycare. As well, we ask that you notify us if your dog has had any recent Bordatella vaccinations. NO prong, pinch, choke or chain/fabric martingale collars are permitted in daycare: QUICK RELEASE COLLARS ONLY! With the reward of having a happy, tired dog comes some risks. Just like a child’s day care, dog day care is a place where the ‘furkids’ are sharing everything. Should your furkid become sick, lethargic or develop a behavioral change, we do ask you share that information with us. By knowing such information we can detect patterns (ie: a bug maybe going around) and we are also able to determine better ways to deal with behavioral changes which allows us to ‘set up’ each dog for successs! Occasionally, these furkids play rough, run like the wind and frolic with enviable abandon, , it is in moments like these that a pad gets scuffed, an ear nipped or some body part scratched. We make every effort to keep nicks and dings from happening, but dogs will be dogs! This is a common, benign wart-like virus transmitted through mouth-to-mouth contact or by shared water and food bowls. The highly contagious nature of this virus and its 30-60 day dormancy means it is likely your dog will eventually contract it. Once a wart appears on a dog, it can take a couple of weeks to become large and fall off. The younger a dog contracts the virus, the quicker it reaches full circle. Hence the name ‘puppy warts’! One health professional compared it to ‘Chicken Pox’ (it’s best to get it over with early. Case in point: our female ‘Ocean’ was four years old when she picked up the virus and it took three months for her big, ugly wart to fall off (it was huge and yet, left NO scar!) Once your dog has had a COPV breakout it is extremely rare that further warts will ever appear. Select dogs may have a dermatological sensitivity to the saliva of other dogs and develop rashes when involved in extensive mouth play. 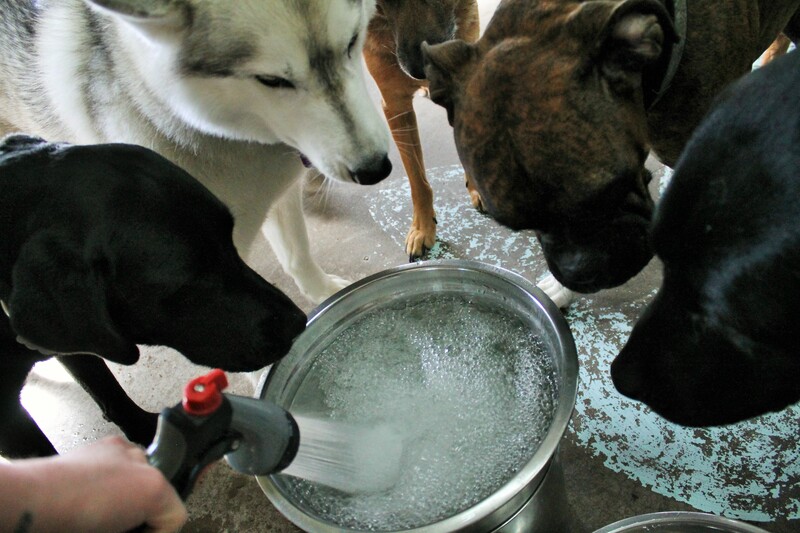 And though we use food-grade no-rinse sanitizer, vinegar (highly effective bacteria killer) and mild dish soap to clean up playroom messes, in rare cases some dogs are sensitive to these cleaners. When the adrenaline starts to pump, many furkids experience a brief episode of diarrhea or soft stool. Usually this clears up on its own. Easy home remedies for mild diarrhea include: white rice, quinoa, yogurt, pumpkin or digestive enzymes. However, diarrhea can quickly lead to dehydration and may be symptomatic of a more serious issue, as it could be colitis, giardia, gastro-intestinal sensitivity or another condition for these reasons you should immediately consult your Veterinarian. ‘Infectious Tracheobronchitis’ is a highly contagious NON-life threatening air-borne virus which causes inflammation of the upper respiratory system leaving dogs with harsh, hacking coughs which often sounds like the dog is choking or gagging. While the Bordatella vaccine may not prevent contracting the virus, it may reduce the severity of symptoms and shorten the duration of the virus. Puppies under 8 months, Seniors, dogs with shortened snouts (ie: pugs, shih tzus, etc) and dogs with high anxiety should be considered candidates for the vaccine and we may ask for it prior to daycare or boarding. Otherwise, it is our policy that the Bordatella Vaccine is not mandatory. When it involves this and other vaccines, you should ask your Veterinarian of the risks associated with vaccine/without vaccine. IMPORTANT NOTE: Every year or so, a new strain of Kennel Cough will hit the area. When we are notified by parents of a dog with a confirmed/suspected case it is typically the beginning of an outbreak. Our policy is once we know there is an outbreak emerging, we will shut down for 2-3 days as a means to slow down/stop the transfer from dog to dog. Our site is exceptionally well ventilated and thoroughly sanitized on a daily basis, but even then we will scrub walls and steam every possible surface. Almost seven years later, we can tell you this: with each outbreak ANY day care kid can contract the virus regardless of their Bordatella vaccination status (ie: no recent to within last 30 days). And remember your dog can contract the virus from greeting any dog on a walk or sniffing the round where a dog has recently sneezed (sounds unlikely but you would be surprised).